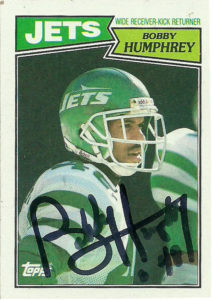 Bobby Humphery was an enforcer for the San Antonio Riders during their 1992 season. 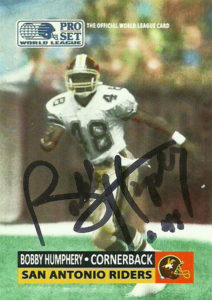 Selected in the 11th round of the WLAF draft, he really provided veteran leadership to the young defensive backs. 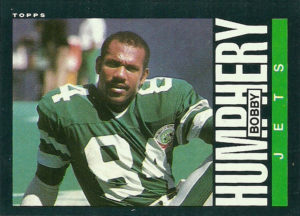 The Riders pass defense was ranked first in the league that year, and they were one of the few teams that could go toe to toe with the eventual World League Champion Sacramento Surge and a key reason for that was Bobby. 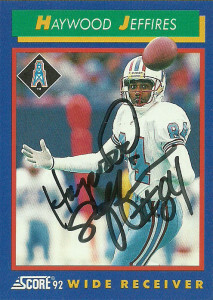 It was a shame that Pro Set pulled the plug on their WLAF set for the 1992 season. While Ultimate and Wild Card filled the vacancy as best as they could peppering their sets with veterans and rookies, for some reason they both omitted the highly decorated Humphery. 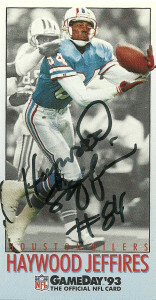 I had to look hard to find any photography of Hump from his days in the WLAF. Apparently he noticed that too, so when Bobby received the custom card I created he wrote me an extremely nice thank-you note. The custom WLAF 1991 entry that I made of him was based off of a Gameday Magazine I had from that 1992 that was sold during the season finale. In the team notes, frequently they’d have a photo or small blurb about a player who has really made a difference on the team. The last one had this grainy black and white shot of Bobby. Although I have found other images on the web, I have not been able to find a suitable enough image, so I decided to go ahead and work with this image in Photoshop. It came out decently enough for a colorized and fuzz adjusted image. While I wasn’t entirely happy with my printer, it was satisfactory enough that I thought Bobby would appreciate it. 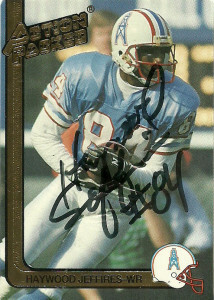 He also included a signed copy of his Topps 1985 rookie card as well as thanks for the additional copies of the Riders cards I gave him. 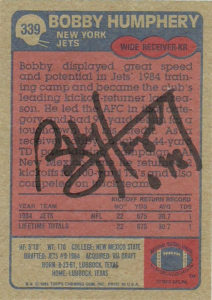 Among Bobby’s greatest NFL accomplishments is that he led the NFL in 1984 with 22 kick returns for 675 yards and a 97 yard touchdown. 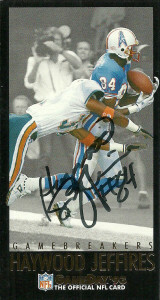 He also had 8 kick returns for 234 yards and a touchdown against the Bengals during the season finale in 1986. 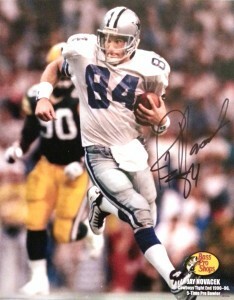 As far as tight ends go, Jay Novacek was one of the best to play for the Cowboys. 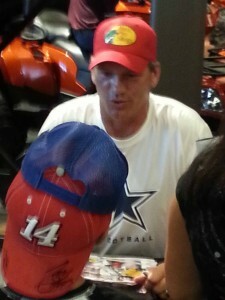 He continues to draw decent crowds to autograph signings he attends. 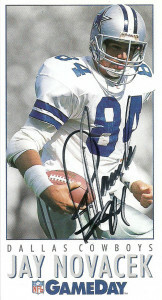 I had not been able to get Jay since early in- I guess 1992 training camp. I heard he was appearing at the Bass Pro Shops Grand Opening with Tony Stewart and a few other rodeo and outdoors/ firearms specialists. It was an absolute zoo. I got there about an hour early and it was a hassle just to park. From there, we were all herded into the hot parking lot- with no water, and promises from an annoying woman that the store opening was at 6PM. Beyond that we were told that the autograph signing was on the right as we entered the front door. Well when we finally got in, it wasn’t until after the grand opening ceremony that ended at 630. None of us were perepared for the ensuing chaos. I got directed not once- but three times to different lines, before I actually got in the right one. It then took 2 hours to get to Jay. Cards: Gameday 1993 Gamebreakers, Gameday 1993, Action Packed 1991, Score 1992. Well the Houston Oilers 25th Anniversary Party got off to a slow start. I expected to be able to recognize a lot of them, but to be kind, it has been a long time. The first guy I was able to nab was Jeffires. True to form he wore his staple long shirt, and sported an epic grizzly Kimbo Slice beard. 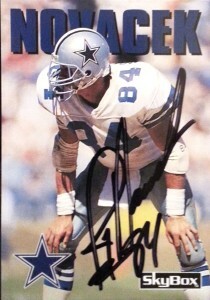 He was in an incredibly good mood, and signed these cards for me. 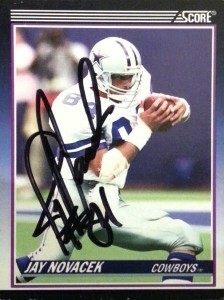 Sure I am slowly running out of cards for him to sign, as I won’t pursue the Saints or ‘Tennessee Oilers’ cards of him, but still, he remains one of my favorite players in a bizarre footnote of my otaku-like obsession. I shot the breeze a bit with him and shook his hand. I stopped him and said, “I can’t believe your hands are so baby smooth after all these years!” We both laughed heartily about it for a minute. I later told him that if he needed to leave, I could stand in for him and tell people that I was Haywood Jeffires. Still I am hitting some pretty nice cards here. Somehow this Action Packed 1991 gem slipped through the cracks up to this point. Otherwise, by 1992 I had stopped collecting many of the brands of cards, and in 1993 I was done with the hobby for a while. I did not pick up Score 1992 or Gameday 1993. While Gameday seemed to respect the evolutionary process- Score’s 1992 effort was looking more and more like a children’s activity book. The redeeming quality of this particular Jeffires card is the great action shot, something that as the manufacturers’ solidified their desperate hold on the soft market- began to slide off a precipice and into the sideline/ warmup gutter.